In reviewing the current literature in physical education, the task force identified several areas as critical to the direction and development of grade-level outcomes: motor skill competency, student engagement and intrinsic motivation, instructional climate, gender differences, lifetime activity approach and physical activity. The goal of the National Standards & Grade-Level Outcomes for K-12 Physical Education is to develop physically literate individuals who are confident in their abilities and knowledge so that they will become lifelong movers. National Standards & Grade-Level Outcomes for K-12 Physical Education focuses on measurable outcomes, empowering physical educators to help students become physically literate individuals. 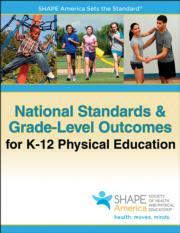 Created by SHAPE America this text presents the new SHAPE America National Standards for K-12 Physical Education, which have been retooled to support students’ holistic development. The term "physical literacy" underpins the standards. It encompasses the three domains of physical education (psychomotor, cognitive, and affective) and considers not only physical competence and knowledge but also attitudes, motivation, and the social and psychological skills that students need to develop to attain physical literacy. Grade-Level Outcomes support the National Standards. These measurable outcomes are organized by level (elementary, middle, and high school) and by standard. They provide a bridge between SHAPE America's National Standards and K-12 physical education curriculum development and make it easy for teachers to assess and track student progress across grades, resulting in physically literate students. In developing the Grade-Level Outcomes, SHAPE America focused on motor skill competency, student engagement and intrinsic motivation, instructional climate, gender differences, lifetime activity approach, and physical activity. All outcomes are written to align with the standards and with the intent of fostering lifelong physical activity. provides administrators, parents, and policy makers with a framework for understanding what students should know and be able to do as a result of their physical education instruction. The result is a text that teachers can use confidently in creating and enhancing high-quality programs that prepare students to be physically literate and active their whole lives.